These numbers are accurate. However Mr. La Monica’s use of a lagging indicator for his strongest point is telling. The economy won’t experience the highest unemployment numbers until it hits bottom. At that point, his commentary would be too late to be of any use. Inflation fears were the main concern during 1930-1933 as well. It was given by investors as the ‘excuse’ for the U.S. corporate bond sell-off. Simultaneously, the CPI was falling. 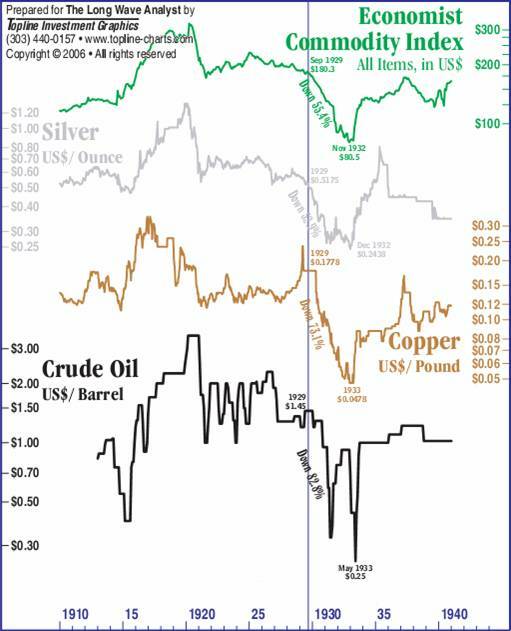 A speculative commodity bust (see chart below) and a rising U.S. dollar would also fit with the onset of the Great Depression. Mr. La Monica’s analysis of today’s environment could have been given in 1930. This is where similarities are even more exact. This ‘third leg of the bear market’ (1930 to 1933) was characterized by the failure of the banking system to provide credit and money for the proper functioning of the economy. 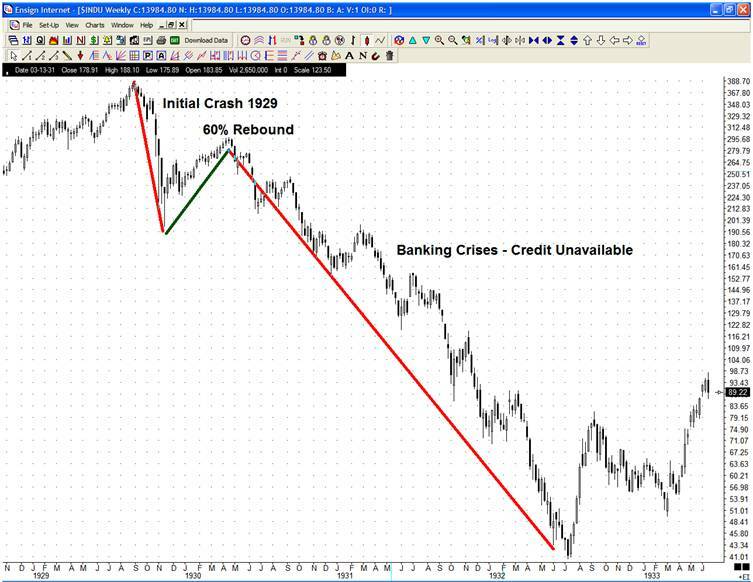 With bank failures currently looming, ignore history at our own peril. This is easily dismissed, because it is factually incorrect. According to Murray Rothbard, before October 1929, the rediscount rate was at 6%. It was lowered to 4% in November 1929, 2% by December 1930, and finally 1.5% in mid-1931. At the same time, President Hoover “increased expenditures by $130 million of which $50 million was new construction.” State and local governments increased expenditures by $700M. The Hoover Dam began construction in 1931. Despite (relatively) greater fiscal stimulus as well as drastic rate cuts, the fractional reserve banking system collapsed in 4 years. Why? Bankers were unable or unwilling to lend, either because of continued losses on real estate loans or because of a run on deposits. The unavailability of credit and money caused the deflationary spiral of the Great Depression. Currently, the Federal Reserve is providing banks access to half of its balance sheet as the lender of last resort. This is to keep the banking system lending. However further mortgage downgrades, financial guarantor failures or the complete use of the Federal Reserve balance sheet could force banks into crises similar to that of 1930-33. We don’t like the similarities either. But we also can’t ignore them. Mr. La Monica’s article represents the current widespread belief that is so commonly wrong at major market turning points. At Lamont Trading Advisors, we provide wealth preservation strategies for our clients. For more information, visit our website or contact us. Our monthly Investment Analysis Report requires a subscription fee of $40 a month. Current subscribers are allowed to freely distribute this report with proper attribution.